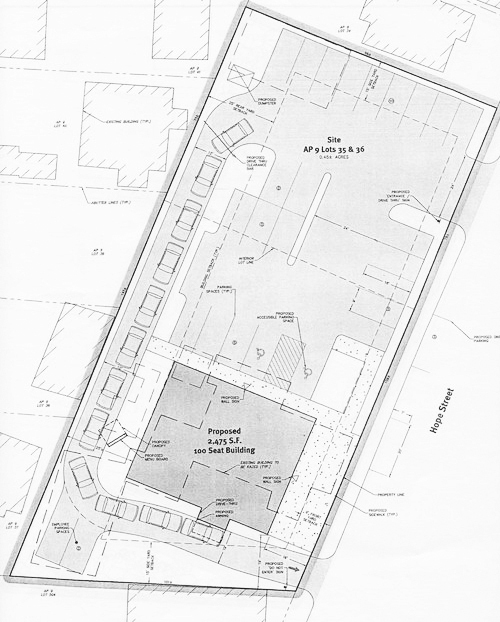 The proposal to build a drive-thru coffee shop at the site of Clarke’s Flower Shop on Hope Street is on the Zoning Board of Review agenda for March 16th. The ZBR meets on Wednesday, March 16th in the Probate Court Room, fifth floor, City Hall, 25 Dorrance Street starting at 5:30pm. Not good. These guys need to go away with their future DD to be. Seriously. That has no place on Hope Street. Below is a link to Providence’s comprehensive plan. The section on the built environment begins on page 24. Providence’s home rule charter Section 1014(d)(1) states: “No public or private improvement or project or subdivision or zoning ordinance shall be initiated or adopted unless it conforms to and implements the comprehensive plan and elements thereof.” Reading the comp plan’s built environment section, you get the idea that a retail establishment with a drive-thru does not conform. The city needs to make it crystal clear, not an interpretation of the comp plan, No Drive-Thrus. They can be written out of zoning if there is a will to do so. The zoning ordinance clearly prohibits drive-thrus in areas zoned R3. The question is, will ZBR uphold it? The applicant is requesting a variance of existing zoning rules, yet the details above say nothing about why they are asking for the variance. The rules are there for a reason. I’d like to change the application process so applicants have to provide a rationale for why the rules shouldn’t apply to them in this case. Otherwise it looks like we aren’t really taking the rules seriously. The Taveras administration is obviously preoccupied with the city’s serious budgetary issues, but does anyone know what the Mayor’s position is for this kind of land-use issue? As far as why the owner of Brewed Awakenings is asking for a drive-thru at that location, he basically stated that the needs of his customers require it, and he needs it to make the project viable. Below is a link to a post where the owner provided feedback to GC:PVD posters. His name is David J Levesque. Also, the ruling from Providence Department of Planning and Development was posted here in which they recommend that the variance request be denied. Honestly, if to be viable in that location, he needs a drive-thru, his business plan needs some serious adjusting. How does Mr. Levesque know that the needs of his customers requires a drive-thru at this Hope Street location? He once had a location downtown, but doesn’t have an East Side location or anywhere else in Providence. His current stores are located in suburban areas not in a central city. Did he conduct a market study? Market analysis reports can be engineered or manipulated to indicate predetermined or pre-expected results. I reached out to a few of the neighbors to see if these guys had worked with them to attempt to modify the plans after the heated meeting in the fall. No changes were made and no attempts by the developers to meet with the neighbors to address the concerns. Let me just say that the idea that DD might go in there is a little off. There’s currently an empty Tim Hortons on Douglas ave that was designed in a similar manner. It’s surrounded by parking with a drive through. It doesn’t look like there are any plans to fill it with something else. Coyndon – Your point about financing is, I believe, a microcosm of why traditional, pre-zoning, urban type development is challenging today. Auto-oriented projects are seen as “safe” and more likely to secure loans for developers. Otherwise, projects that try to fit in with their urban surroundings and rely more on pedestrian traffic are seen as speculative and more risky. Therefore, if one is in real estate and is concerned solely with return on investment, which development pattern do you think you are going to propose to your prespective lenders?